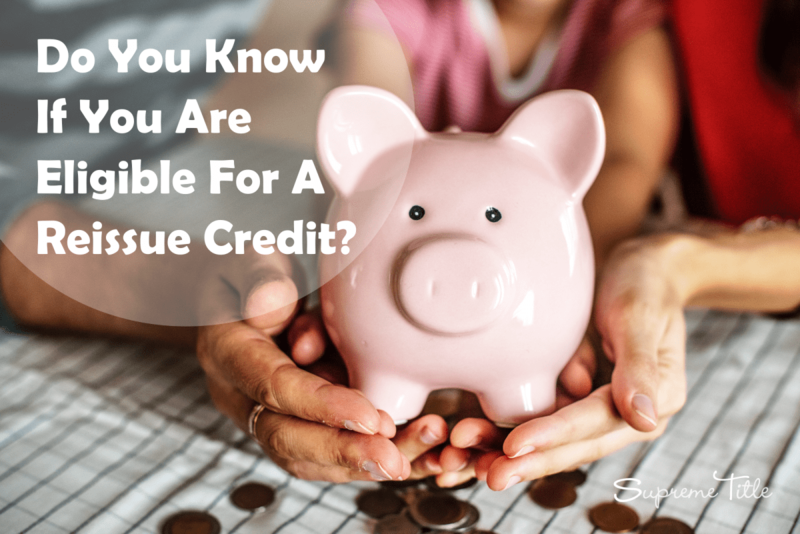 Are you Eligible for a Reissue Credit? There is a sort of legal loophole in Florida law concerning title insurance rates. This loophole, called a reissue credit, could get you a sizeable discount on your policy. Our underwriters inform us that you must be able to prove the real estate being insured had an existing title insurance policy, whether a refinance or through a sale/purchase of the property. Once you are sure of the pre-existing policy, you can consult the information below to determine true eligibility for your personal case. There are multiple criteria that could see you eligible for a reissue credit on your Owner’s Policy of Title Insurance. Selling your property; a vacant, unimproved, lot; or simply refinancing your home will give you access. You might still have some questions… How do you know if you are eligible? How much would this reissue credit be? The reissue rate is available on policies on real property which is unimproved (i.e. a vacant lot). An exception to this rule is for roads, bridges, drainage facilities and utilities, as long as your current Owner’s Policy of Title Insurance was issued prior to the application for a new policy. These changes are conditionally excluded because they are changes made by the city and not by the owner of the property. An important deadline to note is that you are only eligible for a reissue credit within 3 years of the date and time it was recorded. If you are 3 years and 1 day, it is too late. You buy a vacant lot in 1989 thinking you were going to build your dream home on it. Something happens (usually just…life), it is now 30 years later and that particular dream has changed; but you still own the lot. You decide you are going to sell it. Are you eligible for a reissue credit on your Owner’s Policy of Title Insurance? Yes! As long as you can produce your Owner’s Policy of Title Insurance (prior policy) and give a complete copy to your Title Agent, you will receive a reissue credit. Your twins are graduating from high school and heading off to college, yippee!! You are planning on refinancing your home to help with the cost of this collegiate endeavor. Would you be eligible for a reissue credit on this transaction? Absolutely! As long as you can produce your Owner’s Policy of Title Insurance (prior policy) and give a complete copy to your Title Agent, you will receive a reissue credit. NOTE: When refinancing, the reissue credit can be given no matter how old the policy is or how many times you have used it for refinancing your property. Your spouse was promoted and that promotion involves moving to a new country—your home is now up for sale. Are you entitled to a reissue credit on your Owner’s Policy of Title Insurance (prior policy)? As long as it is within 3 years of the date of the issuance (effective date) of your Owner’s Policy of Title Insurance, you will be eligible. NOTE: 3 years is the limit and the prior policy has the date and time it was issued. The amount of the reissue credit will depend on (1) the amount of the prior policy and (2) the amount of the new policy. We will take the lesser of the two amounts to calculate your reissue credit. You are selling your home for $564,000. You originally purchased it for $500,000. Your Title Agent would base the amount of the reissue credit on the $500,000. The reissue credit for $500,000 is $1,045…a good amount of money to save, especially when you, as the seller, are usually the one to pay for the Owner’s Policy of Title Insurance on behalf of the buyer. In a nutshell, if you are planning on selling or refinancing you want to find that Owner’s Policy of Title Insurance that was issued to you when you purchased the property–get it to your Title Agent to start saving money…Every little bit helps! Supreme Title makes no representations or warranties with respect to the accuracy or completeness of the matters addressed. Please contact Supreme Title with questions you may have.